Can You Remove Internet Explorer 8 From Windows 7? The topic came up recently on our How To Uninstall Windows Internet Explorer 9 guide: Is it possible to remove or uninstall Internet Explorer 8 from Windows 7? The short answer is no, it is not. At least not if you mean to completely remove the web browser from the operating system. Internet Explorer 8 ships with Windows 7 and is an integral part of the operating system. Well, that in itself is not entirely true as well as Windows 7 E editions that are sold in the European Union ship without Internet Explorer 8 enabled. The browser is still there though. The best you can do is to remove Internet Explorer 8 from plain sight. I can show you how you can do that, but keep in mind that Internet Explorer 8 is not completely uninstalled from the operating system. If you'd ask me, I'd recommend to upgrade to Internet Explorer 9, configure it for maximum security and forget all about it if you work with a different main browser. That way you got the latest Microsoft browser which is good for your system's security. And since you are not using it it should not cause any problems or issues. That is, unless you use third party software that is using the Internet Explorer rendering engine. Windows XP and Windows Vista users on the other hand can uninstall Internet Explorer 8. I have published a guide about that a few years ago. Open the Windows Control Panel. You can do that with a click on the start orb in the lower left corner, and the selection of Control Panel in the start menu window. 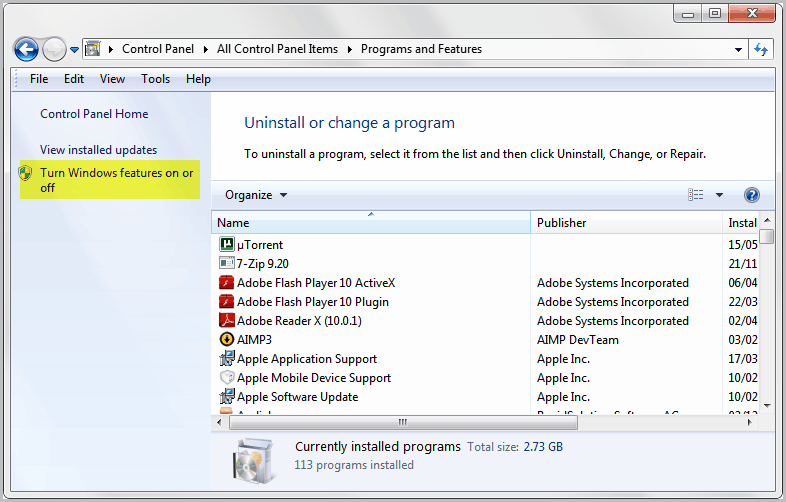 Locate Uninstall a Program in the Control Panel listing and click on the entry. This populates a list of third party programs that are installed on your computer. Locate Turn Windows features on or off on the right sidebar. This spawns a new window with a listing of all available Windows features. Features with a checkmark are installed, those without are not. 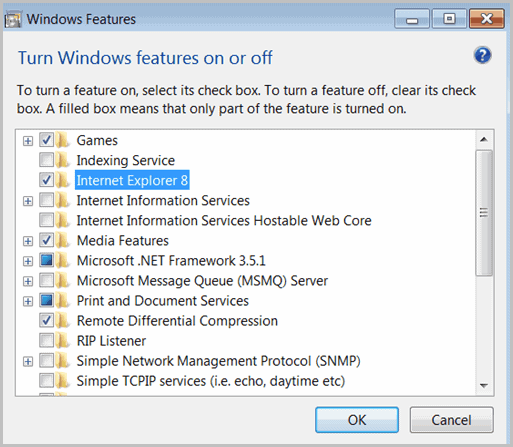 Locate Internet Explorer 8 in the program listing and remove the checkmark next to the Internet browser's listing. 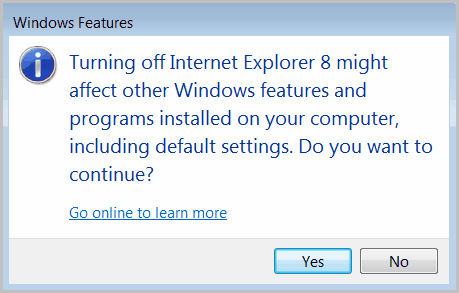 This displays a notification: Turning off Internet Explorer 8 might affect other Windows features and programs installed on your computer, including default settings. Do you want to continue?. Select Yes if you are sure and then ok. You need to restart the computer to complete the removal of Internet Explorer from the system. 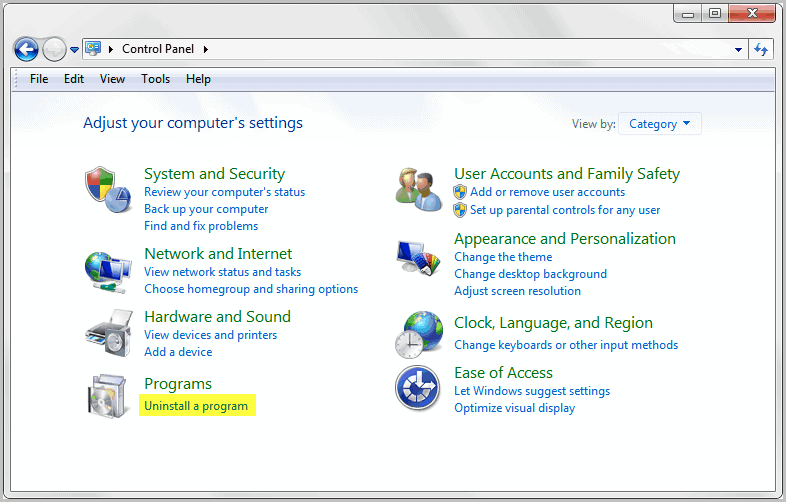 Please note that you can at anytime turn on Internet Explorer 8 again on the system by following the exact same steps. You may need your Windows 7 installation DVD though to add Internet Explorer 8 to the system again. You should monitor third party programs closely after removing Internet Explorer 8 from the system. You have fully working Windows 7 without ANY IE. I do it on all of my PCs. Then I run some registry cleaning tools to remove all references to IE in registry. And I also remove DVD Maker and all other crap that comes with MS W7. It is possible – yikes! I guessed someone missed the whole EU requirement that Microsoft had to make IE uninstallable, and in fact sell a version that didn’t include the browser. The easiest way to have Win 7 IE free is to install the N or KN version. If you don’t have 3G or so left in your bandwidth usage, you can use R7 Lite to remove those components you don’t want. And if you just want to uninstall, it’s simple. Now maybe what is meant by not being able to remove is that Explorer is IE without the internet interface etc. Explorer however, is not IE8 and is just part of the OS – and yes, you can’t uninstall that. I did mention that in the article, but it is not that easy to get those versions in first place. And unless you plan to remove directories manually and perform a Registry cleanup afterwards you do not have an option to remove IE8 from Windows 7.